The publication of Marianne Elliott’s Partners in Revolution, in 1982, not only established her reputation as a fine historian but also changed the way in which all subsequent histories would examine the events of Ireland’s revolutionary decade. Partners was a landmark volume, not merely on account of its rigorous scholarship but because its examination of the complex web of links between the United Irishmen and France brought a vital and dynamic dimension to our understanding of the 1790s. Professor Elliott’s conclusions were based upon her forensic analysis of archival sources, particularly those in France, and it is her unparalleled familiarity with this international material which sets her biography, Robert Emmet: the making of a legend, apart from the other offerings of this bicentenary year. Having read Patrick Geoghegan and Ruán O’Donnell’s two-volume contribution to the story one might imagine that little remained to be said about ‘Bold Robert Emmet’, yet Elliott’s account establishes a broader context in which the hero is examined. Her use of the reflections of Revd James Whitelaw, rector of St Catherine’s, and those of Whitley Stokes, who worked as a physician amongst the poor, brings Emmet’s Dublin to life, while her evidence from the Parisian archives illustrates the difficulty and intrigue which he encountered in the French capital. While Emmet’s reservations about Napoleon are well known, Elliott’s discussion of the republican opposition in Paris is informative, as is her account of the ambitions and anxieties of the United Irish émigrés in the French capital. She is also confident and original in her analysis of the Dublin Castle spy network and of the links between Irish radicals and their English counterparts and the Despard conspiracy in particular, which she describes as ‘a much misunderstood episode in British history’. Her treatment of the trial is nuanced and her description of Emmet’s grotesque execution reflects her familiarity with the literature of execution, particularly V.A.C. Gatrell’s Hanging Tree (1996). Yet while O’Donnell and Geoghegan admire their subject and his endeavour, Professor Elliott’s emotion is one of maternal affection rather than admiration. Throughout she marshals evidence to illustrate his youth, including John Patten’s observation about ‘his boyishness of air’, Catherine Wilmot’s comment on his tendency to blush and William Colville’s dismissal of him as ‘a very giddy young man’. Elliott’s Emmet is young, idealistic and oblivious to danger, while he and Thomas Russell are condemned for their irresponsible belief in their own ability to lead the masses, based upon a slender understanding of what the masses wanted. Significantly, at this point she introduces a novel class interpretation of the events of 1803, arguing that in the crisis the leaders behaved like ‘the impoverished middle classes they were’. ‘Only the truly rich and the truly poor know how to cut their losses’; accordingly, Emmet chose to rise prematurely rather than lose his investment in the enterprise. The United Irishmen were unsuccessful rebels but brilliant publicists; so it was, she concludes, with Robert Emmet, whom a recent Fortnight magazine described as ‘a continuity United Irishman’. And while Ruán O’Donnell argues for the significant constitutional contribution of the proclamations of Emmet, Philip Long and William Dowdall, Elliott believes that these various manifestos have simply given the rising a misleading gloss of sophistication. Above all it was Emmet’s speech from the dock which redeemed the moment and sealed his destiny as the most iconic of Ireland’s many national icons. In this process ‘the sentimental detail is remembered, the uncomfortable forgotten’, and so the author, confident that ‘no one . . . has questioned the Emmet legend’, sets out to examine the reality. The major part of Elliott’s biography consists of an examination of this myth and as such represents a courageous entry by her into the less certain field of memory. The narrative is personal in tone and there is a tendency to interpret her subject through the prism of her life, and that of a northern Catholic. That said, she is sure-footed in her sustained critical analysis of R.R. Madden’s life of Emmet, with its mix of fact and fiction, which she describes as ‘Carlyle’s heroic history par excellence’, ‘uncritical and unreal’. Readers will be familiar with Tom Moore’s contribution to the story, but not necessarily with the connections with Hector Berlioz. This symbiosis between nationalism and romanticism is discussed at length, demonstrating how by the end of the nineteenth century the Robert Emmet story had supplanted the old favourites of several centuries. 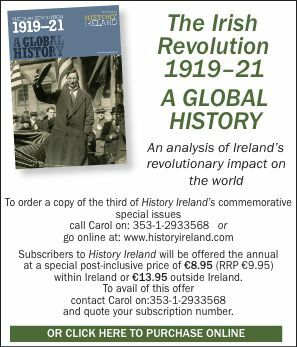 Professor Elliott’s analysis, however, becomes more controversial as she moves from the period of the Revival to the 1916 Rising and beyond. Discussion of Pearse’s ‘morbid Catholicism’, ‘suppressed homosexuality’ and ‘necrophilic eroticism’ will certainly arouse emotions, but these should not detract from her significant attempt to explain Pearse’s Emmet. The inconsistency of Yeats is exposed, swipes are made at the philistine culture of independent Ireland, and there is a brave attempt to read Leopold Bloom’s saunter through Emmet’s Dublin. Elliott’s biography is an important and challenging text. It is not an attempt at a definitive biography but it is thought-provoking. Readers may dismiss her interpretations as ‘revisionist’ or whatever, but they cannot ignore her challenge to engage with the sentiments expressed in Denis Johnston’s The Old Lady Says ‘No!’ (1929). This biography is not so much a revision of Emmet as an attack on the legend and the Ireland it produced. From a very different perspective, Ruán O’Donnell’s latest offering to the commemoration, Remember Emmet, is a beautifully illustrated catalogue of the images and representations of the life and legacy of the hero. Published in association with the National Library, it is modelled upon Kevin Whelan’s Fellowship of Freedom: the United Irishmen and 1798 (1998). It is a handsome volume, containing over 250 reproductions of images, documents and maps. Complete with commentaries and six short essays, this is the perfect souvenir of this bicentenary year.